MSI's CX640MX notebook computer features Intel's second generation Core i™ processor and the nVidia GeForce 410M discrete graphics card as well as 29 functions and external features. Functions include Time Stamp backup and restore technology, HiFre Antenna signal enhancement technology, SRS PC Sound™ wrap around sound, and Light Sensor. The CX640MX is the ideal choice for anyone looking for value and tons of functions at a reasonable price. Taipei—Intel second generation Core i™ processor, the nVidia GeForce 410M discrete graphics card, MSI’s Time Stamp backup and restore technology, SRS PC Sound™ wrap around sound, and Light Sensor are just a few of the 15.6-inch CX640MX's many functions. So how much does a laptop that packs so much run for? The MSI CX640MX is much lighter on the wallet than models by other brands with similar functions. 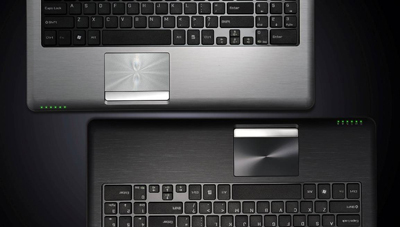 Eric Kuo, associate vice president for global sales, MSI Notebook, notes that the CX640MX not only boasts a rich array of functions, it has a sporty design, integrating an F1 racer-style "push start" button, a slim, tapered, layered profile, a touchpad with crystal diamond finish, hidden hotkeys, a flat silver (black) metal brush finish, and a streamlined ejector button on the DVD player drawer. Intel second generation Core i™ CPU: The CX640MX comes equipped with Intel's second generation Core i™ processor which supports Intel Turbo Boost 2.0 technology to analyze processor workload and automatically allocate processor resources to throttle up core clocks to enhance computing performance. Worth noting, the CX640MX comes with MSI's own boot up technology which gets it up and running in half the time required by conventional laptops, so you don't have to sit around twiddling your thumbs. *Actual boot up speeds will vary with user settings. nVidia GeForce 410M discrete graphics card: The CX640MX features the nVidia GeForce 410M discrete graphics card with 512MB DDR3 of display memory for display performance so impressive that whether you are watching an HD video, viewing a new generation HTML5 website with rich, interactive media content, or embroiled in a melee with bad guys in a DirectX11-supporting game, the CX640MX delivers. Perfect balance between performance and battery time: The CX640MX laptop comes with MSI's GPU Boost technology, so when it's handling heavy load applications, the system automatically switches over to the discrete graphics card for powerful graphics and when it is performing general word processing tasks or browsing the Internet, it automatically cuts to the power-sipping integrated graphics chip mode, striking the ideal balance between performance and battery life. Time Stamp backup and restore application: Who says that consumer laptops lack security? With just one touch, MSI's own preloaded Time Stamp technology performs data backup or restore in moments. Even cooler, Time Stamp can also be set to perform automatically, backing up regularly in as little as ten seconds. If the OS is damaged, systems restore can be performed by simply depressing the Time Stamp button during boot up to get your computer back into tip-top shape. Reinforced structure: MSI didn't stop there, though. 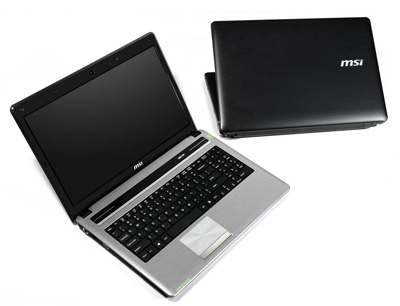 It also reinforced the laptop's structure to provide further hard drive protection. Traditionally, hard drives are located in one corner of a laptop, so if a laptop is dropped, there's a good chance the hard drive is going to be seriously damaged. With this in mind, when designing the CX640MX notebook computer, MSI made a point of placing the hard drive away from corners to further safeguard it. MSI also packed the hard drive in a sort of "air bag," providing more protection against shock. Light sensor extends battery power: To extend battery time while in standby mode, the new generation CX640MX notebook computer comes with MSI's new generation power saving technologies, including ambient light sensor and ECO engine. The ambient light sensor, for example, adjusts screen brightness depending on the surrounding light, making screen viewing easier on the eyes, while extending battery time. Equipped with these technologies, the CX640MX can operate for up to eight hours on one charge. Worthy of note, the CX640MX also provides a quick recharge function. About 80 minutes is all you need to recharge to 80%. *Actual time required to recharge the CX640MX will vary with environments. Intuitive smart function and instant scenario change keys: Do you spend a lot of time looking for functions that you need… often in vain? With MSI's intuitive smart function, you just press the "Fn" key and a window pops up, showing you frequently used functions, like screen brightness, volume, webcam, wireless network, mute, and standby. What's more, you can set the CX640MX to display wallpaper for various scenarios, such as work, meetings, personal, and home. Just press the function key twice to initiate MSI's instant scenario change and quickly switch wallpaper to match the task at hand. New heat dissipation design: The new generation CX640MX laptop's all-new heat dissipation design places heat generating parts and components, like the processor, chipset, and graphics card, in the upper left part of the computer body, so that the palm rest areas remain at temperatures on par with that of the human body to ensure comfort of use. Clutter-free design: Traditional computer cable connector designs do not take user convenience into consideration, putting a tangle of cables in the way. 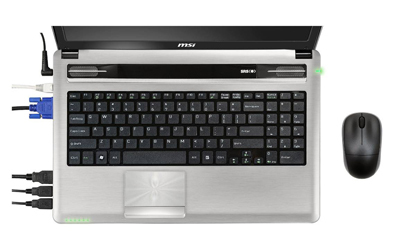 MSI put frequently used slots, like the USB 3.0 and HDMI, on the left side of the computer, while the DVD player is on the right, providing obstruction-free mouse use. The CX640MX also has frequently used I/O ports, like the card reader and audio jack, placed along the front side for quick, easy access. SRS PC Sound: The CX640MX comes with new generation SRS PC Sound™ for natural wrap around, high fidelity sound whether you use the built-in speakers, external ones, or headsets. This machine is designed to satisfy your craving for crisp, clear sound. New transfer technologies: With the CX640MX, new generation USB 3.0 ports and Bluetooth 3.0 are optional. Bluetooth 3.0 boasts data transfer speeds of 24Mbps—three times faster than Bluetooth 2.1. The CX640MX also comes with HiFre Antenna which provides wireless that is 1.3X better and more stable than that found in traditional laptops. Flat black (silver) metal brush finish: The stylish look is inspired by supercars. MSI's design team incorporated a flat black (silver) finish revealing a metallic luster used in luxury automobiles into the exterior of the CX640MX. In addition, the touchpad's crystal diamond finish and the layered texture of the recessed speakers accentuate the overall look and produce a sophistication reminiscent of high-end racecars. Push start "ignition switch": On the left side of the CX640MX is an AC-in power jack designed to resemble a racecar fuel intake and on the right side is a round push start ignition switch. The two details set each other off and are evocative of racecar. Tapered profile and hidden hotkey design: The forward-tapering silhouette of the CX640MX notebook computer is also evocative of F1 racers. The layering of materials that compose the sides cause the bright layers to blend into the delicate etching of the flat black strata, exuding an artsy yet unpretentious feel. The hotkeys on the CX640MX are ingenisously integrated into the metal mesh strip above the keyboard, so while they are still easily accessible, they don't take away from the overall design integrity of this chic machine.